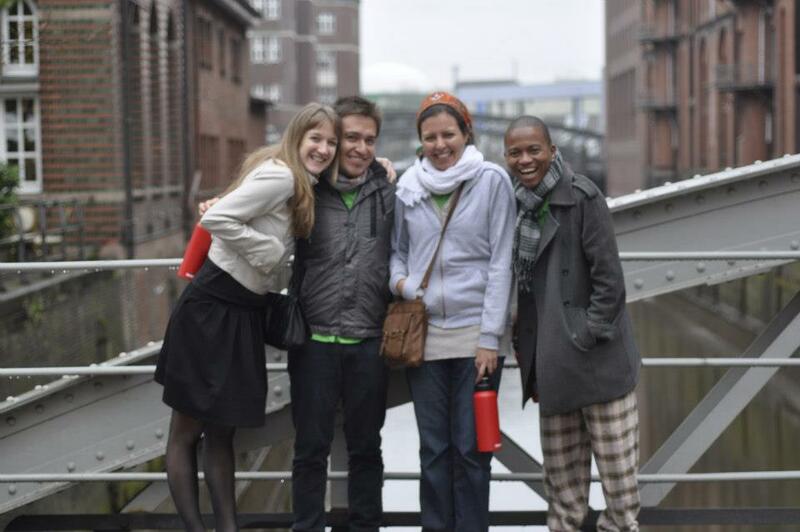 From left to right: Nena, Antonio, Sondos and Eliot (me). What a lovely group of people I have met in the past few days since my arrival at the D&F Academy. Eliot Moleba is a story. His story is of a playwright, theatre-maker and director based in Johannesburg, South Africa. He is very passionate about storytelling and believes that we, as human beings, are made up of no more than a collection of stories. As such, these stories continuously shape and influence who he was, is and will be. Given this immense power of storytelling with the potential to change or transform us, Moleba uses it as a device to identify, highlight and advocate for social transformation and change issues in South Africa. He believes that it is through our stories that we remind ourselves and each other what it means to experience, share and embrace our common humanity. In partnership with Drama For Life and Education Africa, Eliot Moleba has founded The Marikana Scholarship Fund to aid the displaced and stranded children of the miners who were tragically killed in the confrontation with police at the Marikana mine in South Africa. 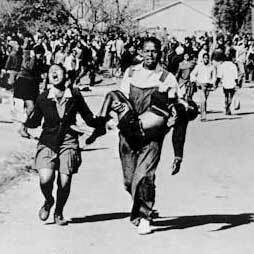 The labour unrest across the country, especially the Marikana tragedy, has left many families without breadwinners. This initiative is founded on the belief that unless something is done to help secure the future of the affected children, the perpetual cycle of illiteracy and unemployment will continue to rise and remain an epidemic for the next generation, and that education is the key to breaking the cycle. The Fund will be collecting donations both locally and internationally to support the education of the children of those who died in the Marikana tragedy, with the hope of raising enough funds to cater for primary, secondary and tertiary education. The project will also partner with local and international universities and schools. Eliot Moleba has also created a theatre production, The Man In The Green Jacket, which is, in part, a response to the Marikana massacre. The theatre production openly dramatizes the question of how such a tragic event will affect the immediate (and extended) family members of the late miners. It will tour locally and internationally to raise both awareness about the tragedy and funds for the communities directly affected by the aftermath. The Royal Court runs long-term play development projects in many different countries, helping to stimulate new writing and bringing many of these writers and plays to London for further work and sometimes productions. At any one time, the International Department will be working with dozens of playwrights through specific projects. Long-term play development relationships now exist through projects and exchanges with writers from Columbia, Brazil, Cuba, France, Germany, India, Mexico, Uganda, Nigeria, Syria and many more. The British Council has been a key collaborator and supporter of many of the Royal Court International programmes and is delighted to be in a position to extend this work to playwrights from South Africa and Zimbabwe. Phase One – Elyse Dodgson, Head of International Department, Royal Court will travel to South Africa where the workshop will take place, accompanied by two workshop leaders to conduct a 7 day workshop for a total of 12 Zimbabwean participants. The aim of the workshop is to support each individual participant in writing a new contemporary play. The workshop will be designed for the needs of each writer, explore individual interests, and in the end each writer will be asked to propose an outline of a new idea for a contemporary and original play. The first draft of this play will be submitted three months after the end of the first workshop. The workshop will consist of group and individual sessions and there will also be time for writing. Phase Two – Once these plays are received, they are read (in their original language by one of our readers/translators if appropriate), who will then make recommendations on how or whether to proceed with each play. The team, predominantly the same (but we try to include a director if possible), travel out to work on the plays individually with the writers and do more group work exploring some common problems. Sometimes at this stage actors are used and workshops and readings done of the plays. This again will last about a week. At the end of this phase, the writers are asked to work on a next draft. Phase Three – The new drafts are again read, assessed and translated before the team returns for the final phase of development work. This can sometimes involve public rehearsed readings in the countries, either of extracts or of whole plays as well as individual meetings with each writer. Sometimes at this phase we attach the writers to local directors who will help to facilitate the development of the plays. The first three phases usually last between 18 months and two years. The workshop will take place at Mokoya Lodge www.mokoya.co.za South Africa. Accommodation, food and workshop spaces will be provided. The British Council office in Harare will book and pay your travel as well as pay for visas to get you out to South Africa for the workshop. Please be aware that you will be required to have a valid passport in order to attend the workshop. The British Council will not be in a position to help pay for any costs related to obtaining your passport. There will also be further activities as described in the 3 phases above, by applying you are committing yourself to being involved in the project for up to two years. The applications will be assessed by a panel consisting of representatives of the British Council, Royal Court and Zimbabwean theatre professionals. We are looking to access emerging playwrights who have some experience of writing plays and you will need to show evidence of your track record of writing plays but you do not have to demonstrate that these plays have been published or performed. You will be notified to whether your application has been successful the week commencing the 10th May 2013. We ask that the application be in English and the workshop will be conducted in English but samples of your work can be written in any language and we will arrange for appropriate translations to be made. The British Council has been working on new writing projects all over the world for many years, one of the great strengths of the UK performing arts practice is the development of contemporary writers and the support they receive in accessing audiences. One of the leading theatres working in this field is the Royal Court in London. The Royal Court was established in the 1950s and its ambition was to produce more new plays than any other theatre in Britain, with plays by Caryl Churchill, Terry Johnson and David Hare sitting side by side with work from young playwrights such as Simon Stephens, Roy Williams and Leo Butler. The Young Writers Festival and International Season continue to produce the hottest new talent from the UK and around the world. This is a picture of Donald Mvolo and myself on my visit to Cameroon’s FATEJ, which is a Biennial theatre festival for children and young people. Mr. Mvolo is a local theatre director and writer. I had such a great time watching performances mostly in French. I never really knew what most of them were about, but it was great just to enjoy the theatrical and physical dynamics of the shows. I was particularly impressed with Donald’s show which managed to transcend linguistic barriers that plunged the atmosphere – I understood his show. Of course, this was helped by two very talented actors. They were very expressive and retained a clarity of gestures. It was a marvel to watch them! Come watch us honour the 16th of June! It’s a day we must all pay tribute to. This is my small part! It’s a once off… it’s the last one …it’s open …it’s gonna be packed …it’s a double bill! Don’t miss any event in your City! follow your city to get alerts on latest events. 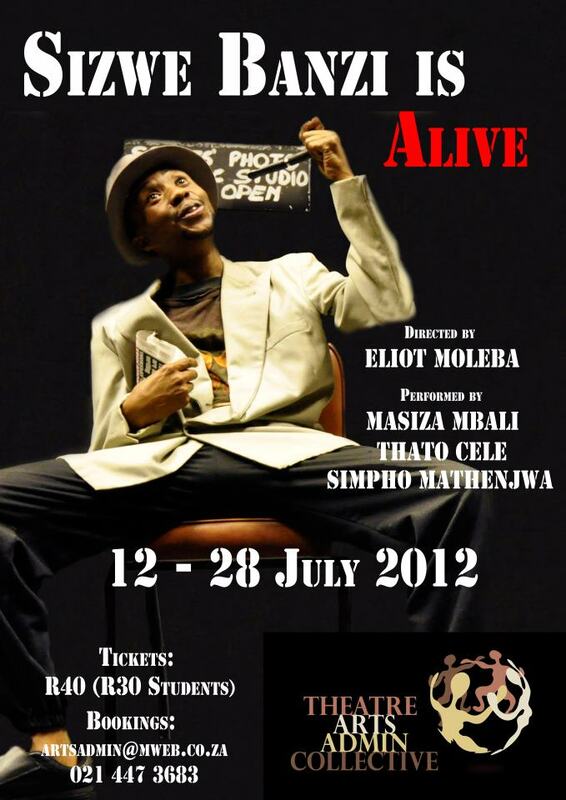 Sizwe Banzi is Alive (working title) is back again but now for its professional debut on stage at POP Art! Through a presentational style, Masiza Mbali and Simpho Mathenjwa, brings to life a few multiple characters who will take the audience through a heartfelt story of a young man’s search for his grandfather, name and past. A definite blast from the past! by new, young, fresh and creative theatrical minds. 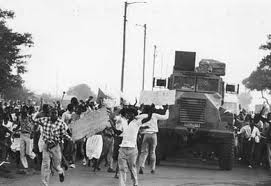 Join us on this EXCITING story and be a part of our humble professional beginnings as we pay tribute to a past that ties a South African people together. Even more so, come and enjoy a journey of a new work that is a reflection and a conversation with one of South African theatrical classics! This experience is guaranteed to leave all your senses enthralled and met with a theatrical delight! We run from the 5 – 8 April 2012! Thursday – 8pm Friday, 8pm Saturday, 3:30pm and 8pm Sunday. The official poster of the show in Cape Town. For every action there is a consequence. For every missing man there is a family living with the mystery of his disappearance. 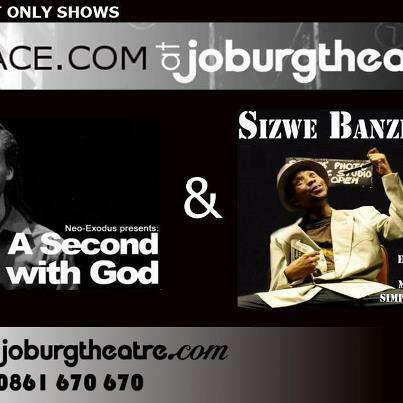 Sizwe Banzi is Alive is a new South African play that recounts a story which is one case of the many unsolved mysteries of our wounded past, people and country. We bring you a heartfelt story of a young man’s search for his grandfather, name and past. A definite blast from the past! by new, young, fresh and creative theatrical minds. Join us on this EXCITING story and be a part of …our humble professional beginnings as we pay tribute to a past that ties a South African people together. Even more so, come and enjoy a journey of a new work that is a reflection and a conversation with one of South African theatrical classics! This experience is guaranteed to leave all your senses enthralled and met with a theatrical delight!